What is DNS Resolver Cache in Windows? DNS Resolver Cache is a local cache temporarily stored on your PC containing any DNS addresses of successful and unsuccessful queries that have been pinged recently and is basically intended to save access time by making your queries faster as well as to cut down on network and worldwideweb traffic. Now, let’s move on to the actual process of flushing the DNS Resolver Cache, which is very easily achieved using the DOS command as below. 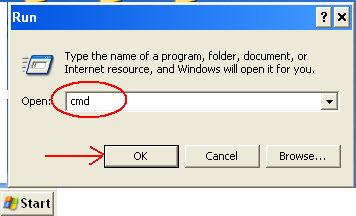 Go to Start » Run… and type cmd or command to open the MS-DOS command window. At the MS-DOS command prompt, type ipconfig -flushdns and hit enter. That’s it!! You’ve successfully flushed the DNS Resolver Cache on your Windows system.